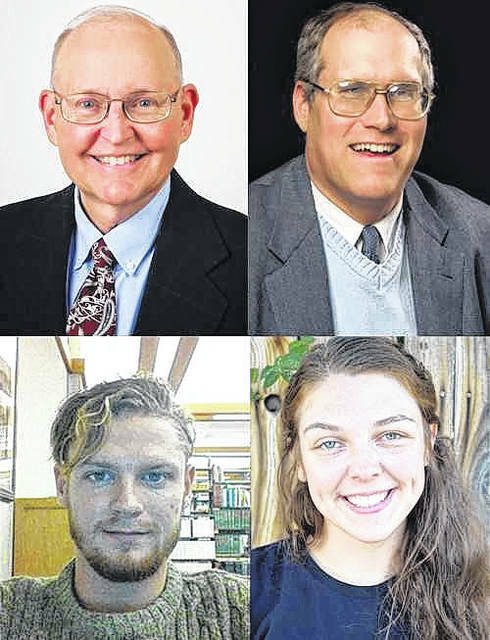 Clockwise from top left, Professor of English Dr. Kent Williams, Professor of History William Plants, Class of 2016 Alumna Klaire Smith and Senior English Major Daniel Carroll. RIO GRANDE — The University of Rio Grande School of Arts and Letters announced its Fall 2017 Spotlight on Success recipients. This semester, the program is honoring Daniel Carroll, senior English major, Dr. Kent Williams, professor of English, William Plants, professor of History, and Klaire Smith, Class of 2016. Chair for the School of Arts and Letters Benjy Davies said each semester Spotlight on Success recognizes a student, faculty member and alumni who have gone above and beyond in their studies, teaching and career. Carroll is a senior English major from Liverpool, England and member of the men’s soccer team. He said studying at Rio has provided him with several academic and athletic opportunities. The faculty spotlight is chosen by the faculty members of the School of Arts and Letters. This year, they chose two colleagues to receive the honor. Williams first came to Rio in 1984 and teaches English and literature courses. He said he enjoys sharing knowledge and learning with his students. Plants has been teaching history courses at Rio since 2005 and also serves as Chaplaincy Coordinator. He said he inherited his love of the subject, and enjoys the opportunity to discuss history with his students. Smith, originally from Portsmouth, Ohio, received her Bachelor of Fine Arts Degree from Rio in 2016. She is continuing her education as a Printer Training Program student at the Tamarind Institute in Albuquerque, New Mexico. Smith said she is grateful to Rio for giving her opportunities to explore options in her field that set her on her career path. Davies said he is proud of this semester’s winners and hopes to see them continue their success in their careers. Jessica Patterson is a communications specialist for the University of Rio Grande.